Version 1.4 uses surface mount capacitors and resistors to further cover edge issue cases. As of version 1.3 in order to fit more stuff RAMPS is no longer designed for easy circuit home etching. If you want to etch your own PCB either get version 1.25 or Generation 7 Electronics. Version 1.25 and earlier are “1.5 layer” designed boards (i.e. it’s double sided board, but one of layers can easily be replaced with wire-jumpers) that is printable on your RepRap with the etch resist pen method, or home fabbed with toner transfer. This board is mostly based on Adrian’s Pololu_Electronics and work by Tonok. Copper etch resists methods suggested by Vik. Also inspired by Vik’s work with EasyDrivers. Circuit design based mostly on Adrian’s Pololu_Electronics. Joaz at RepRapSource.com supplied initial pin definitions and many design improvements. Much inspiration, suggestions, and ideas from Prusajr, Kliment, Maxbots, Rick, and many others in the RepRap community. Once you start putting electricity into your RepRap – even at just 12 volts – you have to take basic, common sense precautions to avoid fires. Just in case these fail, test your workshopsmoke detector. Don’t have a smoke detector? Get one! It may be a problem with the software you’re using (repsnapper). Try using pronterface. 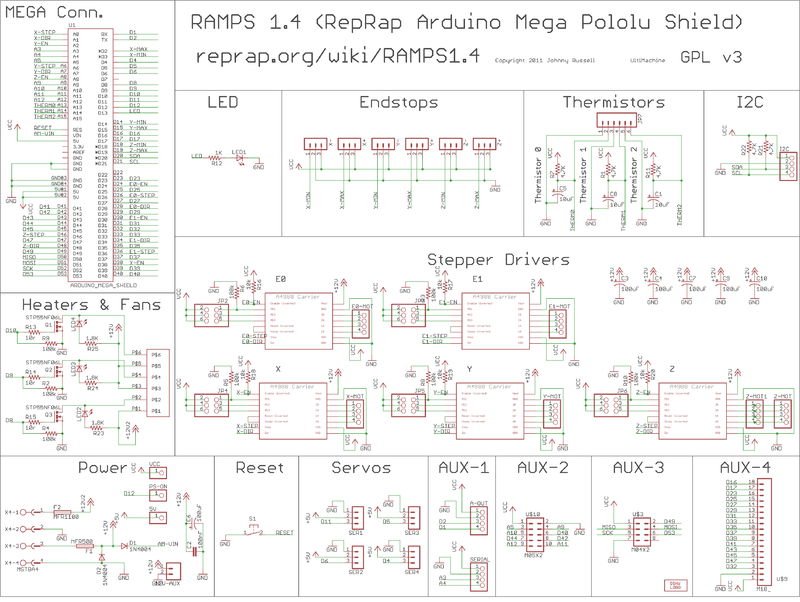 I got a RAMPS V1.3 as part of a kit, but it doesn’t have any installation instructions – just a schematic. Can you point us to a good tutorial for connecting everything? (i.e. stepper motors, opto flag pcb’s, power, data, etc) Some of it (like the single USB port) is obvious, but some of it isn’t. See the connecting power section of your version’s page. The round plug is on the Arduino MEGA and will only power the MEGA. You need to power the green pluggable connector, it should not be reversible and the board should be marked (+) and (-). 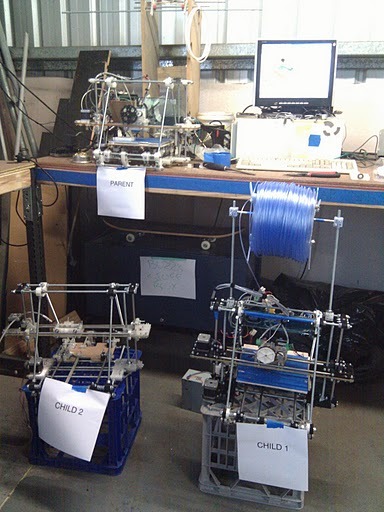 RepRap is humanity’s first general-purpose self-replicating manufacturing machine. Reprap.org is a community project, which means you are welcome to edit most pages on this site, or better yet, create new pages of your own. Our community portal and New Development pages have more information on how to get involved. Use the links below and on the left to explore the site contents. You’ll find some content translated into other languages.